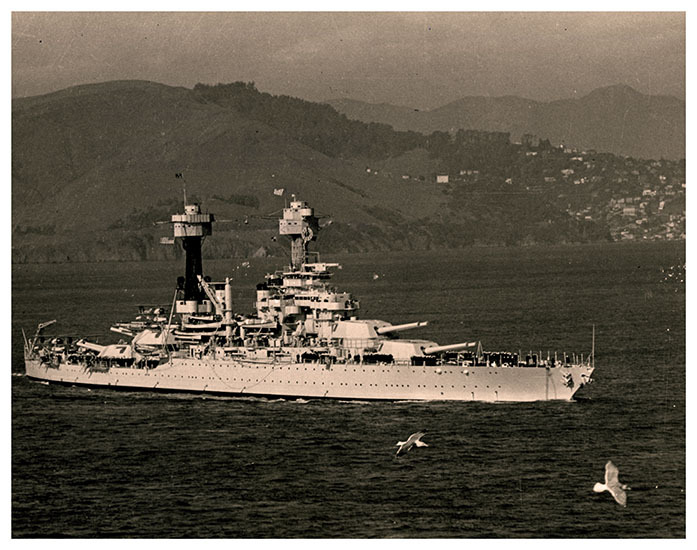 The USS West Virginia Digital Photograph Collection includes over 100 images that document the life of the battleship. Initially launched in 1921, the battleship was sunk during the attack on Pearl Harbor, raised and repaired, and fought in the Pacific theater until the end of World War II. Images included in the digital collection showcase the USS West Virginia’s christening, the attack on Pearl Harbor, and the scrapping of the battleship. Also included are candid portraits of crew members and visiting US Navy officials, scenic views taken from the deck of the ship, and images documenting the installation of the USS West Virginia’s mast on the campus of West Virginia University. These images originate from the WVRHC’s archives and manuscripts collections and the Center’s photograph collection. This online collection does not include other types of materials, such as telegraphs, US Navy memos, menus, correspondence, or ephemera that can be found in USS West Virginia archive and manuscript collections held at the WVRHC. See the Finding Aid tab for more information on additional archive and manuscripts collections which contain USS West Virginia material.